Looks like we are going to have a bit of mixed bag this weekend with the weather and the winds with a SE and some rain, then switching to a NW and some sun later in the weekend and into next week. Depending on what day you go out you may see it flat calm or you might get NW 20 plus, so lets cover some options for the Gulf Islands as well as a short run keeping it close to home. 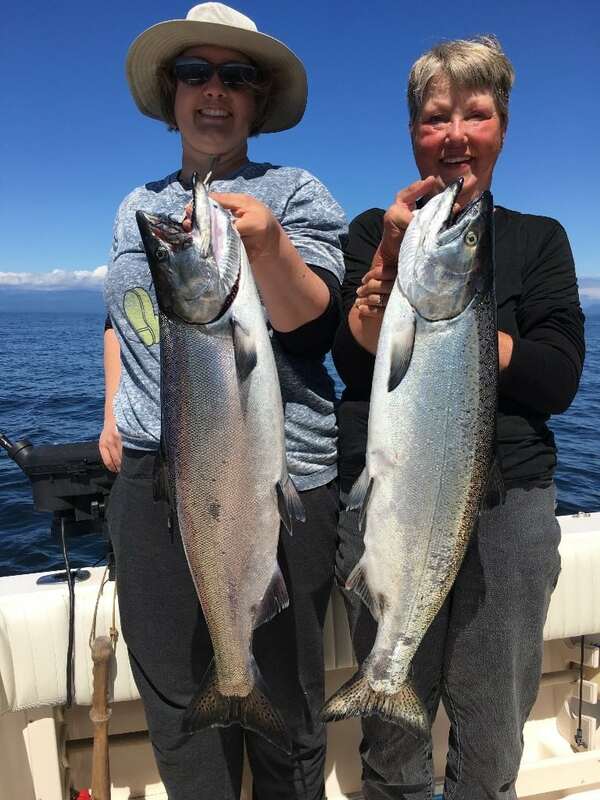 If you are heading over to the Gulf Islands and fishing spots like Porlier or Thrasher, the fish are generally on the structure this time of year, down deep, looking for bait balls of herring hiding on the bottom. This means you should be keeping your gear close to the bottom and you are often in 100-200 feet of water. We generally fish 1 rod per rigger in these situations as we are constantly lowering the rigger and bringing it up depending on the bottom contour. Glow flashers are key, like the Salty Dawg, Phantom Series, and Footloose Series. Chartreuse, green, blue, and purple are all good choices for blade colours in the series just mentioned. Hootchies with a 32-40 inch leader are producing and the splatter back hootchies in blue, chartreuse, and green have been working well. If you don’t feel like fishing the structure you could try fishing off Thrasher Rock marker in 300-600 feet and 120-200 on the riggers with the above gear and you might pick up a few chinook. 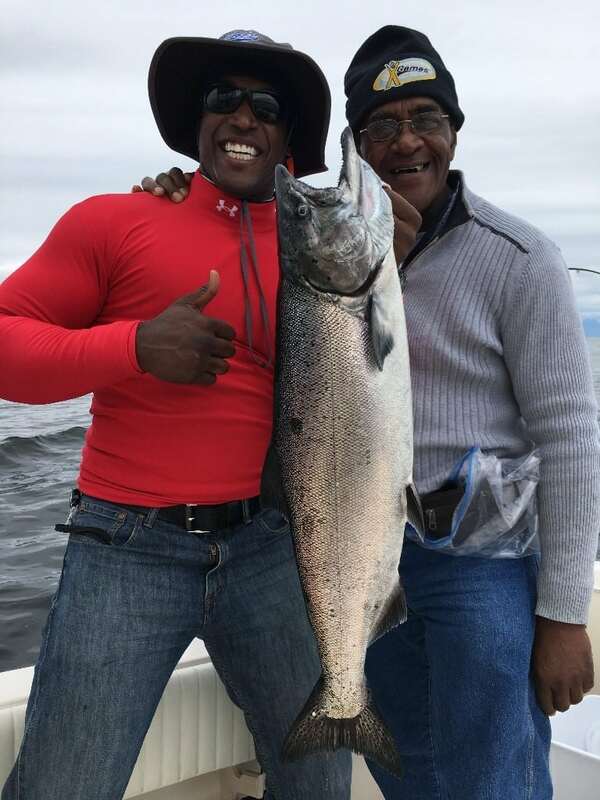 If that isn’t working head out into the deep water and bring your gear up shallow as there has been a lot of coho “offshore” in about 1000 feet of water. By shallow I am talking from the surface down to about 60 on the riggers. Try a hootchy with a shorter leader around 25-28 inches. For colours the coho seem to like white and UV white shades and they also like a bit of pink or red in the hootchy sometimes. Some good colours are the Yamashita OA12R, OAL12R, O11R, OMX1R, and OAX15R. We fish these on our guide boats and have them in stock at the store as well. For flashers use a Betsy, Twisted Sista, Green Onion, Purple Onion, and UV Jelly Fish Yellow Green Mist Kinetic. No need for glow on the flasher at these shallow depths. So that should have you covered if you are heading across. If not, don’t worry there is all sorts of fishing going on over on this side of the Salish Sea. Lets start with the coho again. You can take the same hootchies and flashers as listed above and fish them along West Van from Point Atkinson all the way down to the Cap Mouth. There are already over 1000 coho in the hatchery. Keep your gear shallow, in the top 50 feet or less of the water column for the most part. If the winds allow, do some exploring out on the Hump or even offshore of the Hump where it drops off into 1000 feet into the Strait of Georgia. There have been good catches of coho out there. We stopped off at some current seams and a debris line out in that area on the way back from Thrasher on Monday and hit a lot of coho up to around 6 pounds. We got some reeling in our gear and the deepest we hit fish was 65 on the rigger. By a lot I mean we had some doubles and even a triple. Cover a lot of water until you find a good school and then mark it on your chart plotter and double back once you quit getting bites. Remember you can only retain hatchery coho. If you are looking for chinook you have options as well. South Bowen from Cowan to Roger Curtis has produced chinook everyday this week. It is not red hot like it was in April and May, but it is consistently producing. You will need to make the most of your opportunities because you will be working hard for your bites, but put the time in and you will be rewarded. Bait and spoons have been working well and good rigger depths have been 90-150. 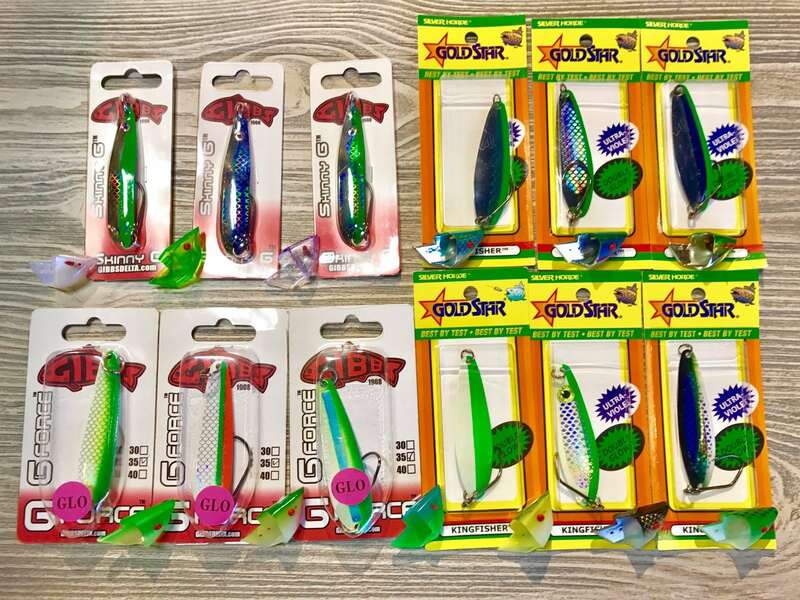 Below is a picture of spoons and teaser heads you should fish up shallow, followed by spoons and teaser heads for your deeper lines. The top row is your UV and nickel finishes and the bottom row is your glow finishes. The pictures never do the UV/nickel finishes justice, but when you put them in the water and they start moving around and the light hits them, you will see their fish catching properties. If you are looking for protected waters you could try Hole in the Wall. It always has some feeder chinook around this time of year and now the odd mature fish headed for the Squamish or Cheakamus is starting to show up. These larger fish are usually around the first 2 weeks of July. The “Hole” is a finicky spot, good one day and slow the next, so don’t wait for a report. If you have the time or want to fish this spot, just go for it! 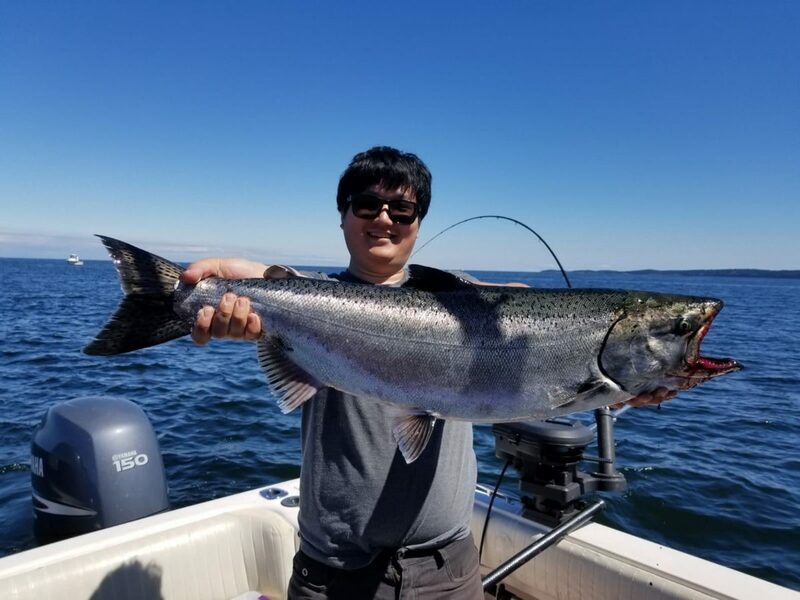 Your next bite could be an undersized feeder or it could be a “size XL” mature chinook. Bait and spoons are also good choices, see picture above. 50-100 is good in the morning and then as the sun hits the water go deeper, 80-140. Crabbing is slowing down. The commercial fleet has been open for a few weeks now and we can see there are fewer keepers around each trip.